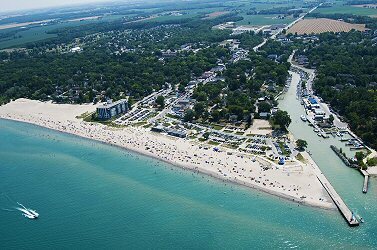 City selects Grand Bend as best location for Gateway’s new casino in South Huron, Ontario. Building a new casino in Ontario is no easy task. Forget the cost or the labor involved. In the time it takes to get from, ‘Hey, wanna build a casino?‘, to ‘Welcome to our grand opening!‘, you could have a child and send it to college! We’re still in the infantile stages of the Ontario Lottery and Gaming Corp‘s (OLG) desire to build a gambling facility in South Huron, which is all the more impressive since it’s likely that a destination for the casino has already been chosen. But there still may be a very, very long road ahead. Discontent from neighboring communities could be the first hurdle in moving forward. With that said, it’s been confirmed that a majority vote by South Huron City Council has pin pointed a preferred location for the upcoming casino. No surprise to residents of the community who know the landscape, they selected the lakeside community of Grand Bend. At a City Council meeting on January 21, 2019, Chief Administrative Officer Dan Best encouraged the City Council, in accepting the responsibilities and benefits of becoming an OLG host municipality, to vote in favor building the facility in the former Stephen Township (Grand Bend) community. CAO Best also motioned to authorize city staff to begin communicating with OLG officials and Gateway Casino & Entertainment, the company charged with construction and oversight of the impending gaming property. The council voted in majority favor of both recommendations, simultaneously stamping their seal of preference on an area between South Huron’s Dark Horse Winery and Huron Country Playhouse. This gives the city the go ahead to start consulting with Gateway on future plans. Once the entertainment group submits a proposal—one that council has already earmarked for “a wide variety of entertainment options such as sport games, charitable gaming, electronic gaming devices and live table games; live entertainment, restaurants and hotel”—the potential need for zoning law amendments will be addressed. In a press release later that week, Mayor George Finch expressed his interest in expanding the municipalities entertainment-driven tourist industry. “South Huron is an established destination that attracts tens of thousands of visitors each year. We will continue to work closely with neighbouring municipalities and partners to explore ideas that grow the regional tourism economy,” said Finch. Will Neighboring Communities Dispute Grand Bend Casino? Almost immediately after South Huron Council published the results of that meeting, Bill Weber, Mayor of neighboring Lambton Shores and Warden of Lambton County, raised the metaphorical caution flag. Weber admits he’s not familiar with the process of bringing a casino to a provincial municipality in Ontario, but said he’s talking with officials to get up to speed as quickly as possible. Above all, he hopes that public perspective is sought before any nails are hammered in the plan for a new casino in South Bend.